You might not have heard of Safety Helmet Assessment and Rating Programme (SHARP) but it’s a UK government scheme that was launched by the Department for Transport (DFT) in 2007. • To provide clear information and advice on how to buy a motorcycle helmet. • To provide clear, objective information about the safety of motorcycle helmets available to riders in the UK. SHARP was formed off the back of worrying statistics regarding the safety and standards of bike helmets on the market in the UK in 2007, statistics it wants to change. What does SHARP do to helmets? 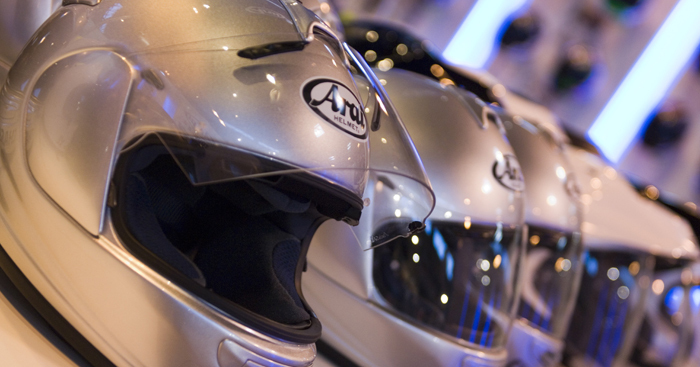 SHARP independently tests motorbike helmets that are available on the UK market. That means SHARP buys helmets from high street retailers before putting them through their paces with a number of strenuous tests. All in all, each helmet has 32 impact tests carried out on it at three different speeds. Different sizes of each helmet are tested against different anvils to represent flat surfaces and kerbs, which mirror on the road impacts. The findings of each test are then collated and a star rating awarded with five stars being the highest award and one star the lowest. What about British and European standards? Every helmet SHARP tests has already passed either a British Standards (BS) or European Standards (ECE) test, otherwise it wouldn’t be on sale in the UK. What SHARP does is add more detail to those safety tests, highlighting the differences between one motorbike helmet from the next. According to SHARP, it has found differences in performance of as much as 70 per cent between high and low scoring helmets. The SHARP rating therefore tells consumers which helmet performs better because even a one star SHARP rated helmet will protect you to a certain extent. How do I know my helmet’s SHARP rating? As we’ve already said, every helmet on sale in the UK will have passed BS or ECE standards but knowing your helmet’s SHARP rating is a bit more difficult because it’s not published and plastered all over the place. You can however check your motorcycle lid’s SHARP rating online but be warned, the site can take a bit of time to load. You can input your helmet’s make, the individual model and select whether it’s a full or half face version. You’ll then see your lid’s star rating, how it performed in the tests and the individual features it has. The SHARP website also shows how your helmet performed in some of the individual tests using a colour key. So if in the Front and Crown Impact test, your helmet offers ‘very good’ protection on your crown, there will be a green colour shown on the crown of the head in the animation. However if your helmet provides ‘poor’ protection on the front of your head, there’ll be a black coloured area at the front of the head in the animation. What’s the point of the individual test insight? The individual test insight from SHARP gives riders an insight into where their helmet performs best. Overall a helmet can be rated three stars from SHARP for example, but it may perform really well in some tests and quite poorly in some others. The individual test insights give riders much more of an idea of why their helmet has received the star rating it received. SHARP tests helmets regularly however there are some helmets that will not be on their site, usually because they haven’t got round to testing them yet. If that’s the case for your helmet then you can suggest your model to SHARP for testing.